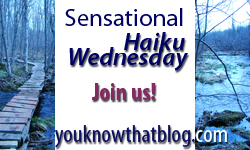 Sensational Haiku Wednesday « You know… that Blog? So you’re interested in Haiku? Excellent! Welcome aboard. I have to warn you straight up; it’s addictive. Haiku* is Japanese in origin (so it only makes sense that a Canadian born Irish woman should latch on to it, don’tcha think?) and is simply 3 lines of non-rhyming words, of 5, 7 and 5 syllables respectively. Traditionally about nature, we certainly don’t need to stick to that theme. In fact, we’ll have a different theme every week! Please note that Sensational Haiku Wednesday is no longer active. Thanks to all who participated over the years! Haiku makes me smile broadly! It is, frankly, the most inane sort of poetry, yet it makes me smile. You might be asking – is this a Meme? Well, yes, yes it is. In the loosest sense, of course, since it changes by theme each week, and “meme” (pronounced “meem”) by definition is something that remains the same throughout history, handed down by words, gestures, dance, and even genetically. If you’re still reading this page, I have a confession for you. Over a decade ago I became interested in haiku due to a comic strip. It’s true! Darby Conley had launched his fabulous new comic strip entitled “Get Fuzzy”, and I was hooked on the mean little sociopathic cat Bucky, and the gentle, naive dog, Satchel, owned by “Rob Wilco”. It’s a very clever comic strip, and I always get a good laugh from it. It took me 10 years to do anything worthwhile with haiku, but… here we are! I hope you enjoy creating and sharing as much as I do. A final note: I was told by a reader when I first started this meme that what we’ve been doing all this time is not so much “Haiku” but “Senryu” because we aren’t specifically discussing nature, and we often inject humour to our works of literary brilliance. In fact, he’s right. However, I’m not a Haiku purist – and most people, which until that day included me, don’t know and really won’t care to know the difference. What we’re doing is expressing our thoughts and feelings in a format that makes us happy. It tickles our funny bones. It inspires creativity and, more importantly, camaraderie. So really, what we call it is largely irrelevant. But thanks for your opinion.